Our family is finally healed of illness. I am so thrilled. I had forgotten what a normal "poopy" looked like. Thankfully, 4days have revealed NORMAL. Yea! David and Daniel are feeling better and it is refreshing to have my boys back. This past week was the best week at daycare they've had yet. David came home with a GOOD JOB! sticker on his sheet and apparently had a wonderful day. He comes home singing songs that they learn in class and talks up a storm about everything. It is so cool to have a conversation with a (almost) 3 yr. old. Daniel is usually pretty good at school but does seem to cling a little more lately. He eats like a horse, twice as much as David usually and needs a bath after each meal b/c he enjoys his food so much. I went to the gym for the first time in months this week. I've decided to try out spinning again. It was great and oh how I missed that "its good for you" feeling after class. I screwed it up, however, b/c I ate too many to tell you , girl scout cookies tonight at work. Our past weekend was fun. I always look forward to our weekend off together. We enjoyed breakfast together and hung out playing outside, while daddy worked. 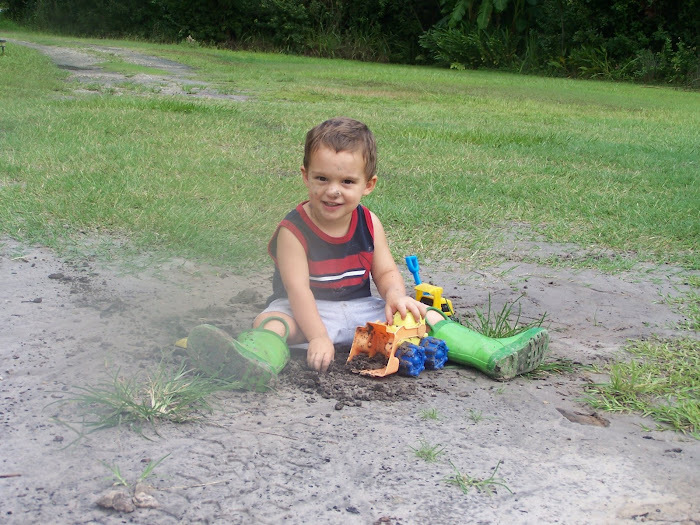 David gets his hands all dirty, and tells me he's dirty b/c he's 'been working outside all day', like daddy. It's so cute. That evening we splurged and had one of our Caylee's (both our sitters are named Kayle, but spelled differently) watch the boys. We took advantage and went our class potluck as a couple. It was so nice to be with all of our close friends and eat. Did I say eat? Well, it was great to actually eat a plate of food casually, relaxed tasting every morsel. I came home stuffed. What a great evening. Sunday morning was a good day at church. Our speaker was Steve Saint, the son of one of the pilots killed on mission in Ecuador years ago. The movie End of the Spear depicts the story. He shared an awesome testimony of forgiveness and how a man can be changed forever in Christ. His passion was contagious and I yearned to have an obedient heart such as his, reaching beyond ourselves. I could truly see how God blesses beyond imagine when our hearts and minds are in line with His eternal goal. The afternoon was topped off with more fellowship with the ladies at Abby's baby shower. It was quite a splendid time of encouragement, laughter, and showering a dear mommy to be. As our class is growing, our friendships are taking on new shape and depth. I cherish such awesome friends. Today we took off and went with daddy to an auction. I had never been to the real thing, where the guy talks really fast and you can barely understand what he's saying. There wasn't much there that I wanted to buy; I discovered it was just a fancy garage sale. The kids had fun running around and Daniel tried out most of the toys. His favorite was an old rocking horse, like the ones on a stand. He had himself rockin so hard the whole lifted up off the ground and he just laughed. He is definitely the dare devil of the two. As we drove home, David proceeded to tell me he was reading his Bible. He was actually reading his truck book, but I guess to him it may be close. I realized I had some work to do to help get this straight but it was cute. Lookin' good, Blog queen!! I like the background. You always have cute things to write about. Your boys are soo fun! Hope to see you this week. So glad you made it to spin. Once you do it a few times, and realize you are not going to die, you'll like it :) Glad the boys are feeling better. Was great to see you!!! I had to laugh at the "bible" thing. At least he has the desire, right? I bet God grinned!